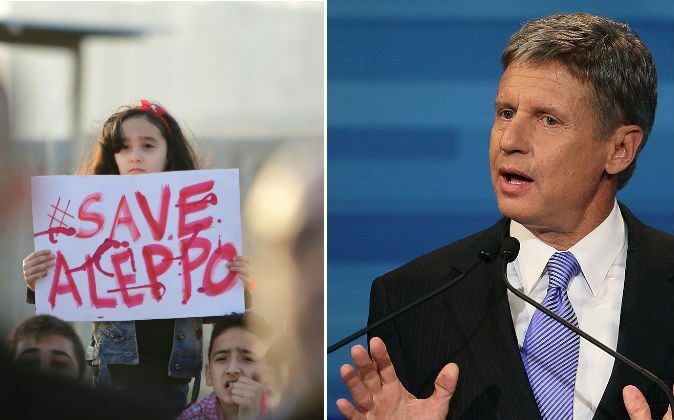 Libertarian presidential candidate Gary Johnson stumbled when he was asked a question about the Syrian city of Aleppo, a highly contested battleground in the Syrian conflict. “And what is Aleppo?” Johnson said. Johnson explained that he was not kidding, and the panelist told the presidential candidate that Aleppo is “the epicenter of the refugee crisis” in Syria, which gave Johnson enough information to answer the question. “Okay, Got it. Well, with regard to Syria, I do think that it’s a mess,” he said before laying out his position of working closer with the Russian government in the war-torn country. “I think the only way that we deal with Syria is to join hands with Russia to diplomatically bring that at an end but when we’ve aligned ourselves with—when we have supported the opposition, the Free Syrian Army, the Free Syrian Army is also coupled with the Islamists, and then the fact that we’re also supporting the Kurds and this is, it’s just a mess,” Johnson said. Co-host of the show Joe Scarborough jumped on the foreign policy misstep in his followup question. “You asked ‘what is Aleppo?’ Do you think that foreign policy is so insignificant that somebody running for president of the United States shouldn’t even know what Aleppo is, where Aleppo is, why Aleppo is so important?” Scarborough asked. “This morning, I began my day by setting aside any doubt that I’m human,” he said. The New York Times, in their reporting on Johnson’s comments, also erroneously referred to Aleppo as “the de facto capital of the Islamic State.” The newspaper also said that Aleppo, not Damascus, is the capital of Syria. The New York Times later issued corrections for both claims. Johnson has been making a big push in recent weeks to meet the required 15 percent to get on the first debate stage. His campaign aired its first TV ads last week and is receiving support from former Republican presidential candidate Mitt Romney who said that Johnson should be on the debate stage.